Following the earthquake that devastated Port-au-Prince, Haiti, legions of international relief agencies, estimated to number close to 10,000, flooded the capital to provide emergency services. Now, more than 15 months later, Haiti is still in emergency mode, still has the infamous tent cities, and remains at a virtual standstill. While highlighting the challenges Haiti still faces, Dr. Amodio will provide insights into areas where Haiti can now begin to envision reconstruction and a new future based on self determination, education and the basic tenets of civil society. 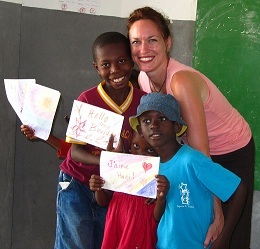 In early May, Sara visited Haiti and will have very current information about the situation on the ground. Sara holds a Masters in Social Work from Stockholm University in Sweden. Her doctorate is in educational psychology from Regent University where she specialized in educational program evaluation and cross-cultural comparative studies in education for young women. Following her graduate work, she received specialized evaluation research training through the Royal Swedish Academy. As apart of this training, she collaborated with the Swedish International Development Agency to evaluate educational capacity in South Africa. NOTE: The Annual Meeting of The City Club of Denver will precede the program. This is our last program until September. Have a wonderful summer!